Play with the 2 Cannon pointing at each model. 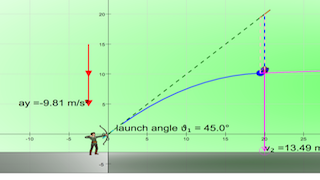 This simulation can be used to illustrate the thought experiment "The Monkey and the Hunter" often used to illustrate the effect of gravity on projectile motion. A hunter with a blowgun goes out in the woods to hunt for monkeys and sees one hanging in a tree, at the same level as the hunter's head. The monkey, we suppose, releases its grip the instant the hunter fires his blowgun. Where should the hunter aim and when should he fire in order to hit the monkey? Do you know why the cannonball always hit each other provided they point at each other and velocities are pointed towards each other and greater than zero? is conceptually in the green line being without the effects of gravity, the cannons ball will meet as predicted by Newton's 1st Law of motion without net external force. now, adding the same gravitational acceleration means both cannon balls will move down at the same rate ( pink lines). therefore, the 2 cannon balls has to collide .